Who's In It: Robert Mitchum (Thunder Road, The Way West), Janet Leigh (Little Women '49, Psycho) Wendell Corey (The Great Missouri Raid, Rear Window), Gordon Gebert (The Flame and the Arrow, The House on Telegraph Hill), and special guest star Harry Morgan (High Noon, MASH) as a cop in one scene. What It's About: A woman's (Leigh) Christmas is turned upside down when her feelings for a department store clerk (Mitchum) complicate her relationship with her lawyer boyfriend (Corey). How It Is: What a great transition from Noirvember to Christmas. I saw this (or rather, the last half of it) a few years ago and have wanted to see it the whole way through ever since. It's totally romantic comedy and if it was remade today it would go straight to the Hallmark Channel. 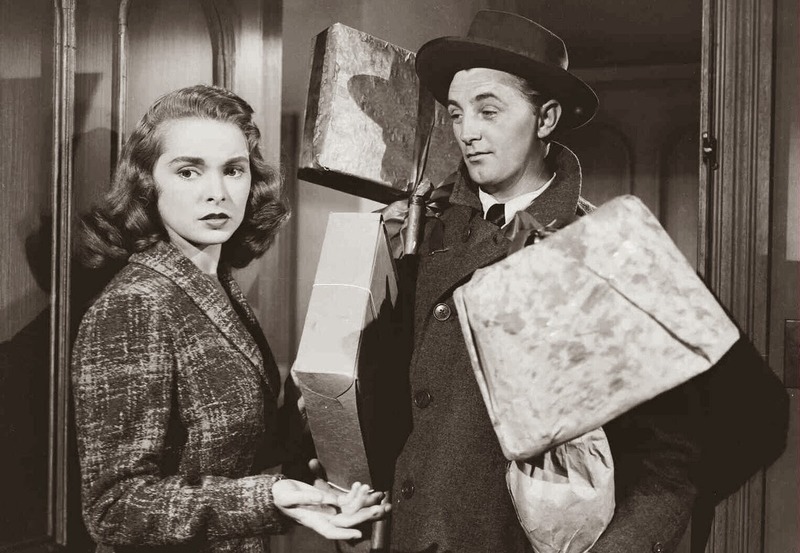 But it's got Robert Mitchum and Janet Leigh and some other excellent performances, so its a new holiday classic for me. This is an early role for Leigh, who plays the main character Connie. It was Leigh's tenth film, but her debut was just a couple of years earlier and it's easy to see why she was so busy so quickly. She's stunningly beautiful, for starters, but she's also crazy good and totally reels me in as a young widow trying to raise her son Timmy (Gebert) on her own. She's got support, including her in-laws and her boyfriend Carl, but she's also fiercely independent and protective of her and Timmy's autonomy. That's kept her distant from Carl - who desperately wants to marry her - and it's also a problem when she meets and becomes attracted to Mitchum's Steve. 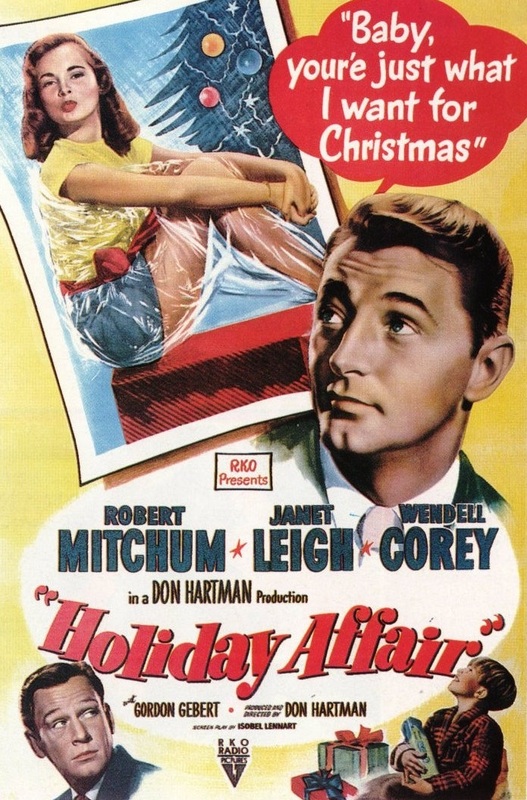 Holiday Affair is an unusual genre for tough-guy Mitchum, but he's not exactly playing against type. He's still super confident and charming; he's just not punching anyone. And he gets a lot of opportunity to interact with kids, which is adorable. Gebert is great, too. You could swap him out with little Ronnie Howard and I wouldn't complain, but the movie wouldn't be any better. He's a good actor and super cute. And I quite like Corey as Carl. One synopsis I read describes him as "stuffy," but that's not the impression I got. He's solid and reliable, but he's also very clearly, deeply in love with Connie. He's a great guy and I especially love a speech he gives about the relationship he wants to have with Timmy. Unfortunately for Carl, it's also clear to the audience that Connie's not in love with him. But it'll take Steve to get everyone on the same page. The story isn't unique, but the cast is so good that I get wrapped up in their characters. This is one I'm adding to my annual Christmas marathon. Rating: 4 out of 5 best couples ever. 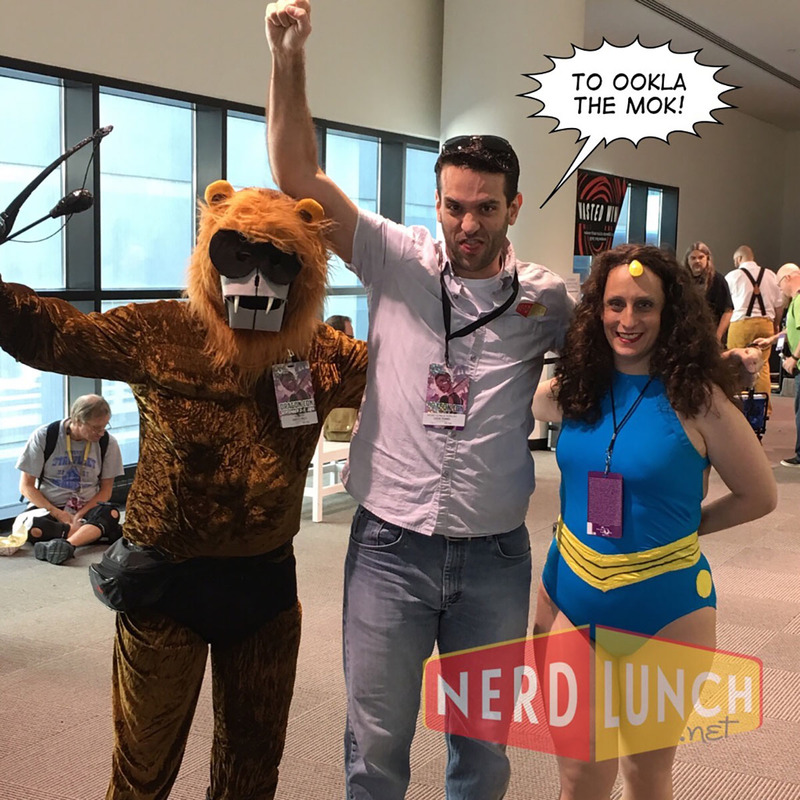 In this special episode, we took a break from recapping the show to talk with very special guest, Thundarr the Barbarian writer Buzz Dixon! He's a great storyteller and had lots to tell us about not just working on Thundarr and his time with Ruby-Spears, but anecdotes from all across his prolific career: from Tarzan and the Super Seven to GI Joe, Transformers, and beyond! If you're a fan of cartoons, especially the Saturday morning variety, you don't want to miss this episode! I'm wrapping up Noirvember with another Robert Mitchum movie that's been on my list for a long time. It's the inspiration for the title of our Thundarr the Barbarian podcast, so it's about time I finally watched it. Who's In It: Robert Mitchum (The Night of the Hunter, Cape Fear), Gene Barry (The War of the Worlds, Bat Masterson), Keely Smith (sang with and was married to Louis Prima for a while), Sandra Knight (Frankenstein's Daughter, The Terror), and James Mitchum (son of Bob). What It's About: A moonshine runner (Robert Mitchum) fights a war on two fronts (the law and a crime organization trying to take over the territory) while trying to protect the people he cares about. 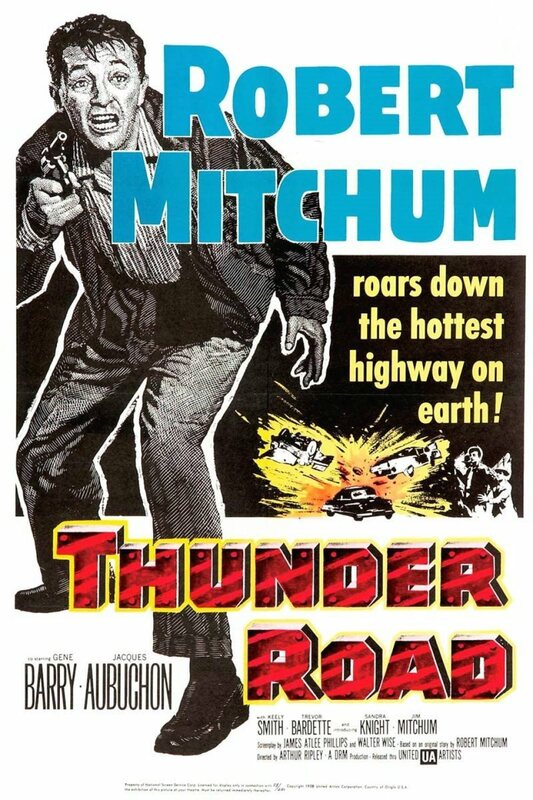 How It Is: Mitchum's as charming as ever and I really love that his son is playing his kid brother. They don't just look alike; they also have a lot of chemistry and it raises the stakes considerably to believe so deeply that Luke (Robert Mitchum) is desperate to keep Robin (James) out of the driver's seat. I do wonder how awesome it would have been if Elvis Presley (Mitchum's first choice to play Robin; curse you, Col. Tom Parker) had been in the film, but as much as I love Elvis, I'm not sure I'd want to trade in James. There's a lot of cool driving stuff, with Luke using a couple of different, tricked out cars. And I enjoyed his confrontations with the law (represented by Gene Barry) and the crime syndicate. The Appalachia and Memphis settings are cool, too. What pulls the movie down for me though is Luke's unconvincing insistence that he can't escape his job. It's not even that he really wants to escape it. He clearly loves it and simply refuses to give it up. But what's never clear to me is why he feels that way. He has a lot going on in his life including his family and two women who care deeply about him: a Memphis nightclub singer (Smith) and local girl Roxie (Knight). He cares enough about all of these people to want to keep them at a distance where they won't be hurt by his occupation, but not so much that he's willing to give it up and do something different with his life. That would be a great conflict to explore if I better understood what's keeping him behind the wheel in the first place. Rating: 3 out of 5 proto-Duke Boys. On the latest Mystery Movie Night, Dave, David, Erik (he's back! ), and I are joined by my good buddy Evan Hanson to talk robots, Russians, and Roy Rogers. Is AI a misunderstood work of genius or a big giant mess? Who's the best Jack Ryan? Is Die Hard a Christmas movie? We figure it all out. Speculative Chic's Justice League Sound Off! I'm a very occasional contributor to the Speculative Chic website and this week was one of the occasions. I joined some of the other writers to talk about Justice League and we're mostly in agreement about how well it succeeds as the next step in Warner Bros' attempt to build a DC cinematic universe. Go check it out! Who's In It: Dana Andrews (Laura, Night of the Demon), Rhonda Fleming (Spellbound, Out of the Past), George Sanders (Foreign Correspondent, Son of Fury: The Story of Benjamin Blake), Thomas Mitchell (Stagecoach, The Outlaw), Vincent Price (His Kind of Woman, House of Wax), Sally Forrest (Son of Sinbad), John Drew Barrymore (Drew Barrymore's dad), and Ida Lupino (The Adventures of Sherlock Holmes). What It's About: The heads (including Sanders and Mitchell) of three branches of a media empire compete to catch a serial killer (Barrymore) in order to impress their new boss (Price) and win the top spot in his reorganization. How It Is: I love how complicated the movie is. Like how the general plot description above doesn't even include the main characters, Ed (Andrews) and his girlfriend Nancy (Forrest). Ed is a TV news commentator in the same media company that the others work for, but he doesn't want the new position for himself and throws his connections and investigative skills behind his friend Jon Day Griffith (Mitchell). Unfortunately for Nancy (who works for George Sanders' character, Mark Loving), part of Ed's plan is using her as bait for the serial killer. And if that's not betrayal enough, Ed's not exactly resistant when Loving throws his own girlfriend, columnist Mildred Donner (Lupino) at Ed. So there are multiple dramas playing out at the same time: who'll get the top spot, will the killer be stopped, can Ed and Nancy's relationship survive it all, and do I even want it to? Noir is all about flawed characters, but there's flawed and then there's butthead, and Ed falls into the latter category. He asks Nancy's permission to use her in his trap, but he does it after he's already planted the bait for the killer to see. And after he drunkenly makes out with Mildred, he plays the victim when Nancy gets upset. Sally Forrest is lovely in the role though and I believe that Nancy is smitten with Ed, so I end up rooting for them to work it out. But it's a struggle. The rest of the film is super compelling and strong, though, with great performances all around. 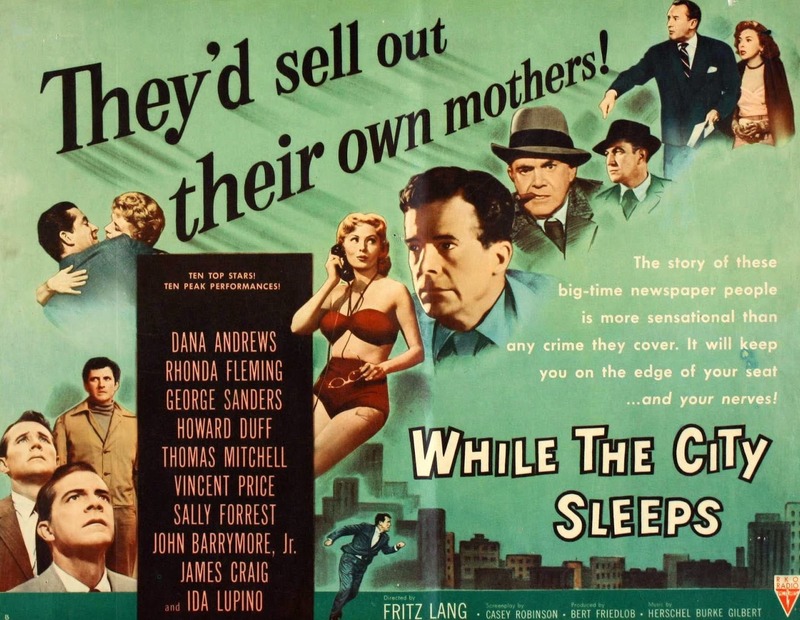 Rhonda Fleming is a standout as Vincent Price's wife (who's having an affair with one of the candidates and scheming to have him win the job) and Price once again solidifies my position that film noir Price is better than horror Price. Rating: 3.5 out of 5 intrepid reporters. Who's In It: Robert Mitchum (The Lusty Men, Angel Face), Shelley Winters (Winchester '73, The Poseidon Adventure), and Lillian Gish (The Birth of a Nation, Intolerance). 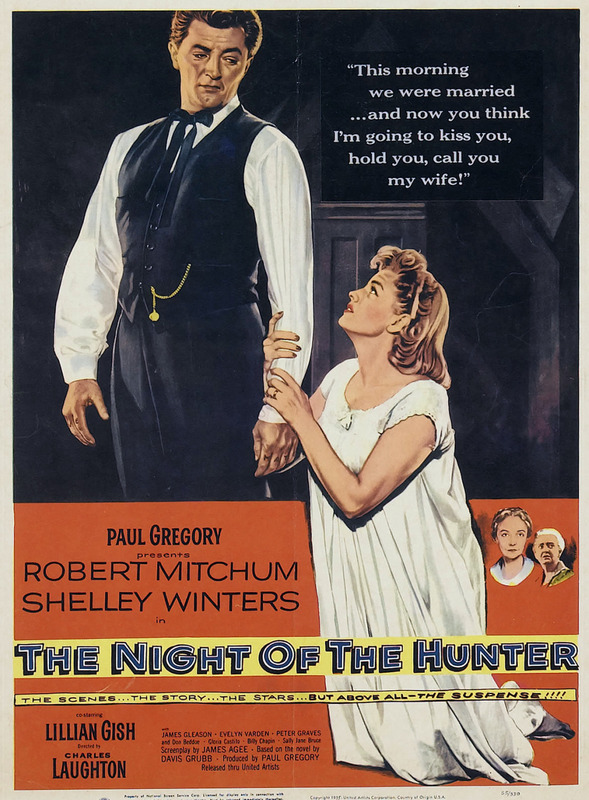 What It's About: A serial killer (Mitchum) turns his attention to a widow (Winters) and her two kids, thinking that one of them must know the location of some money hidden by their deceased husband/father. How It Is: A stylish thriller with the emphasis on "stylish;" often to a fault. The story is great and some of the performances are also great (particularly Mitchum and Gish), but I'm not always sure what Charles Laughton is up to in his one and only directing credit. Laughton and cinematographer Stanley Cortez create some stunningly gorgeous shots and I love the use of Harry's (Mitchum) singing "Leaning on the Everlasting Arms" to build dread. What I don't like is the way the film rushes through some elements. Some of that's a script problem. Willa (Winters) falls for Harry at a ridiculous, unconvincing speed, for example, but there are multiple points where I'm totally lost about why someone is behaving the way they are. Pearl's (Sally Jane Bruce) reactions to Harry are equally mystifying. I also don't like a lot of the editing. There's a cool sequence where people are talking about how Willa needs a man and the dialogue is cleverly intercut with shots of Harry's train in transit, but the cuts themselves are matter-of-fact and artless. 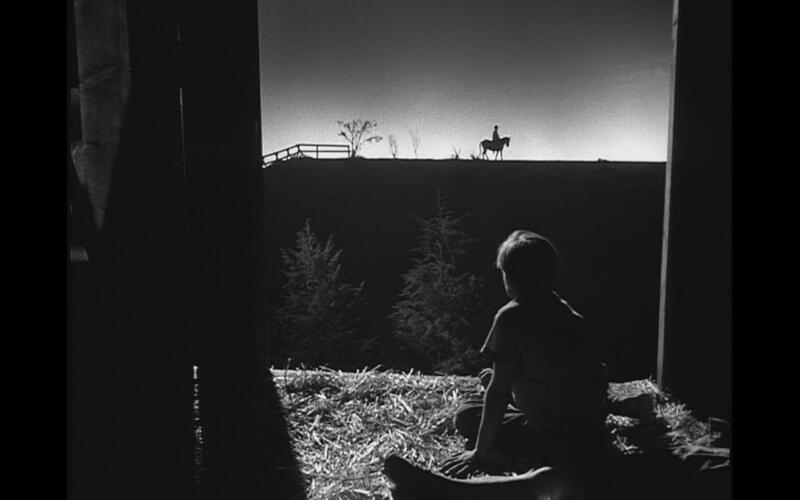 Every step of the way The Night of the Hunter is trying cool things and I appreciate that, but only about a third of them are successful. Rating: 3 out of 5 creepy clergymen. Early science fiction writers had it tough. Little or no pay and even if you succeeded, everybody thought you were nuts for writing "that junk." It should not be surprising that many of them were young men trying out a new interest. One of these was Green Peyton Wertenbaker, a sixteen-year-old who submitted his first story to Hugo Gernsback's Science & Invention, a non-fiction magazine that occasionally published "Scientifiction" stories. Wertenbacker's first try was called "The Man From the Atom" and it appeared in April 1923. 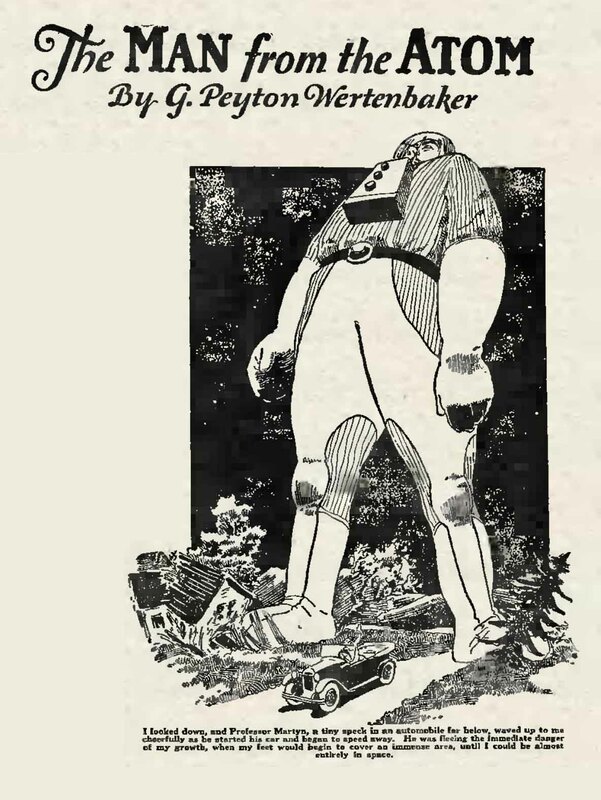 But Hugo had bigger plans for Scientifiction and G Peyton Wertenbaker. April 1926 saw the reality of Gernsback's dream of a magazine filled only with science fiction. 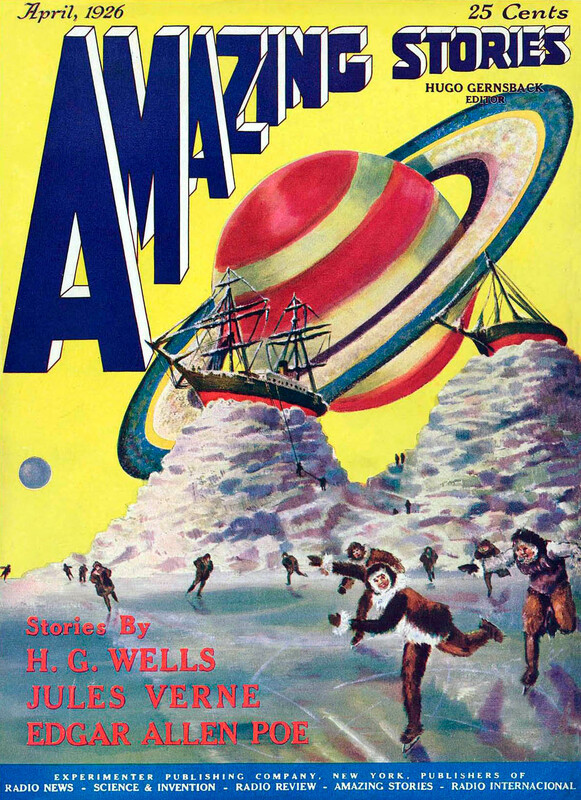 It was called Amazing Stories and it reprinted Wertenbaker's tale along with Jules Verne, HG Wells, George Allan England, Austin Hall, and Edgar Allan Poe. 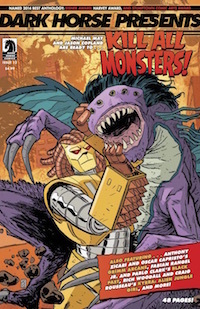 The entire first issue was made up of reprints. So was the second, with the exception of "The Man from the Atom (Sequel)." As suggested by its odd title, it was the second part of Wertenbaker's tale of the man who could control his size. It was also the first new science fiction story to appear in an all-science-fiction magazine. So why isn't G Peyton Wertenbaker a household name? 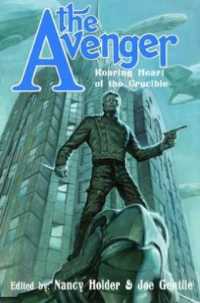 Mike Ashley in The History of the Science Fiction Magazines, Part 1 (1974) wrote of Wertenbaker: "He was born in Virginia in 1907, and deserted the science fiction field after but five stories, all competently written and deserving of further reprinting. (Although one must grant the licence of some rickety science)." Like so many writers after him, including RF Starzl, Edwin K Sloat, Charles W Differin, and many others, Wertenbaker would leave SF behind to pursue more lucrative fields. 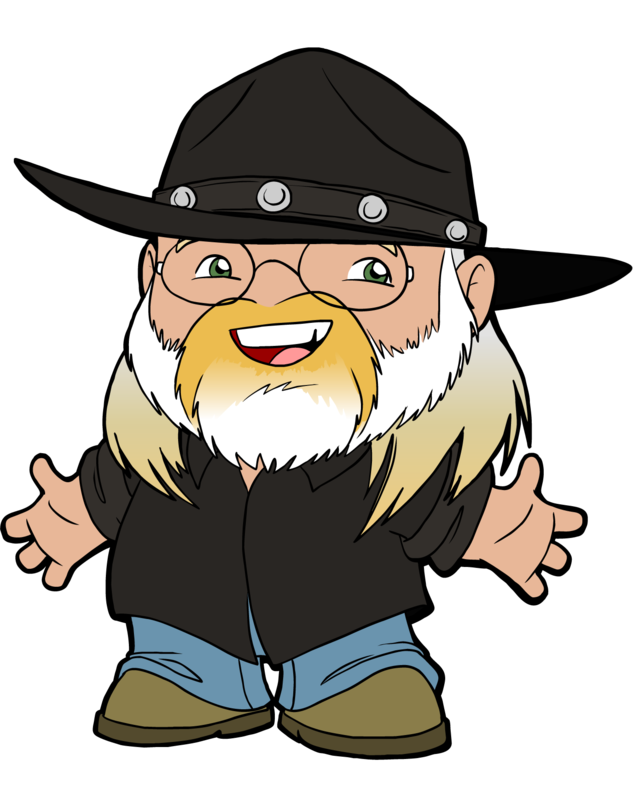 (He would become a professional technical writer, a writer of regional novels, London correspondent for Fortune magazine, serve in the Navy, then work at NASA. He would help Hubertus Strughold write The Green and Red Planet (1953), a scientific appraisal of the possibilities of life on Mars. What more could a SF writer want? "The Man from the Atom" (Science & Invention, April 1923 and reprinted in Amazing Stories, April 1926). A young man named Kirby, eager for adventure, volunteers to try out a new device that Professor Martyn has created, one that can expand or shrink someone to infinite size. Kirby experiences growing larger than the planet, then the solar system, then the universe. But afterwards, he pines for Earth when he realizes that while he was expanding, time was moving faster back home than for him. Even returning to normal size, everyone on Earth has long since passed away. The tale ends with a cryptic mention of Kirby's going to live with a cruel, but advanced race that treats him like a primitive caveman. This story was significant, for it built on ideas Ray Cummings had used in "The Girl in the Golden Atom" (All-Story Weekly, March 15, 1919) and Henry Hasse would expand on in "He Who Shrank"(Amazing Stories, August 1936). "The Man From the Atom (Sequel)" (Amazing Stories, May 1926) shows the race that Kirby ends up with. They are an advanced people, but the men are all emotionless scientists and the women, who are considered inferior, are more like our own Earthfolk. Kirby's education into this new civilization falls to a girl named Vinda. It is Vinda's uncle who finds a way for Kirby to get home to Earth -- sort of. He postulates that time is circular and that if Kirby expands to great size in a certain fashion he could return to a world that is the next incarnation of 20th Century Earth. The scientists calculate exactly how this can be done and Kirby is too busy with the expectation of returning home to notice that Vinda has fallen in love with him (even though she is programmed to marry Edvar in a stale, emotionless marriage). Kirby returns home only to realize he too is in love with Vinda and leaves again to find the next incarnation of her and her world. The final product of all this expanding (and time traveling) is pretty annoying since Kirby comes off as being a bit thick. The influence of HG Wells's The Time Machine is obvious, with the Time Traveler returning to Weena's time at the end. "The Coming of the Ice" (Amazing Stories, June 1926) was written when Wertenbaker was nineteen and was the first new story not based on a reprint. This tale follows Dennell, a man who gains immortality by an operation. The doctor Sir John Granden and Dennell's fiancee Alice die in an auto accident, leaving the immortal to suffer the long years ahead in loneliness. We follow his years as an academic, taking multiple PHDs, but ultimately being left behind as the human race evolves beyond his capabilities. Dennell suffers as a primitive curiosity as the human race grows large brain and weak bodied. When the ice comes, this proves to his advantage, being physically superior to the future humans. It becomes bad, with only a remnant of mankind living at the Equator. The immortal is forced to feed on his fellow men until the last survivors commit suicide together. He is alone and writing a history of mankind that no one will ever read. The story showed a much finer touch to the clunkier "The Man From the Atom." "The Chamber of Life" (Amazing Stories, October 1929) follows Barret, a filmmaker who wakes up in a lake. While returning home he recalls the night before when he had met a scientist named Melbourne. Piecing together what has happened, Barrett remembers that Melbourne showed him his "Chamber of Life," a virtual reality room that took Barrett to a perfect world where he met Selda and fell in love. The Chamber of Life acts directly on the brain so when Barrett left the chamber he experienced both worlds before ending up in the lake. The story ends with the man sadder, knowing he will never see Selda again, but unwilling to find Melbourne and return to her. Many SF critics credit Ray Bradbury's "The Veldt" as the inspiration for the Star Trek holodeck, but this story predates Bradbury by twenty-one years. It even has the germ of the famous Geordie LaForge/Leah Brahms love story arc. That Bradbury read this story in his youth is likely. Beside the holodeck inspiration, this story, with its fragmented structure, shows Wertenbaker taking a new, maturer command of his writing. It is in my opinion his best work. "The Ship That Turned Aside" (Amazing Stories, March 1930) (as Green Peyton) is a variation from Wertenbaker's usual formula. In this tale, a ship passes into the fourth dimension and a scientist named Pretloe offers his ideas on what has happened. 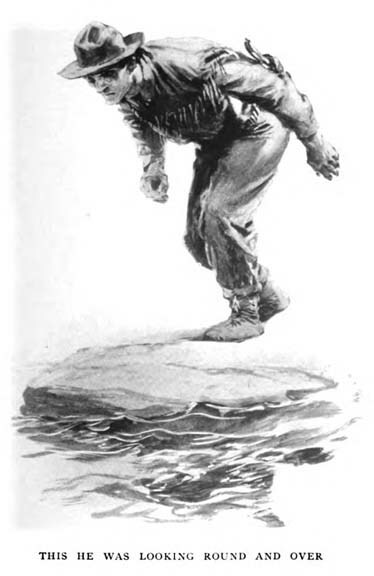 Captain Weeks discovers an island that the narrator, Pretloe, and Weeks explore. There they find a city that they approach, only to find themselves in Paris. Another doorway from the fourth dimension lies there. Wertenbaker anticipates much of the interest in the Bermuda Triangle with this tale. EF Bleilier thought this tale one of the best to appear in Amazing Stories. "Elaine's Tomb" (Amazing Stories Quarterly, Winter 1931) tells of a college professor, Alan Frazer, who is madly in love with one of his students, Elaine. He goes to Egypt with a fellow teacher, Weber, who is trying to decode an ancient secret that predated the Egyptian civilization. While there, Frazer dies of a tropical fever, but before he dies he gives Weber permission to preserve his body as the ancients did. He wakes to find himself in the far future where the sun is old and red. He is revived by the future humans who turn out to be lazy, disinterested folk, who have all their needs met by robots. Frazer discovers there is a famous building in the north called "Elaine's Tomb" and he must go there. 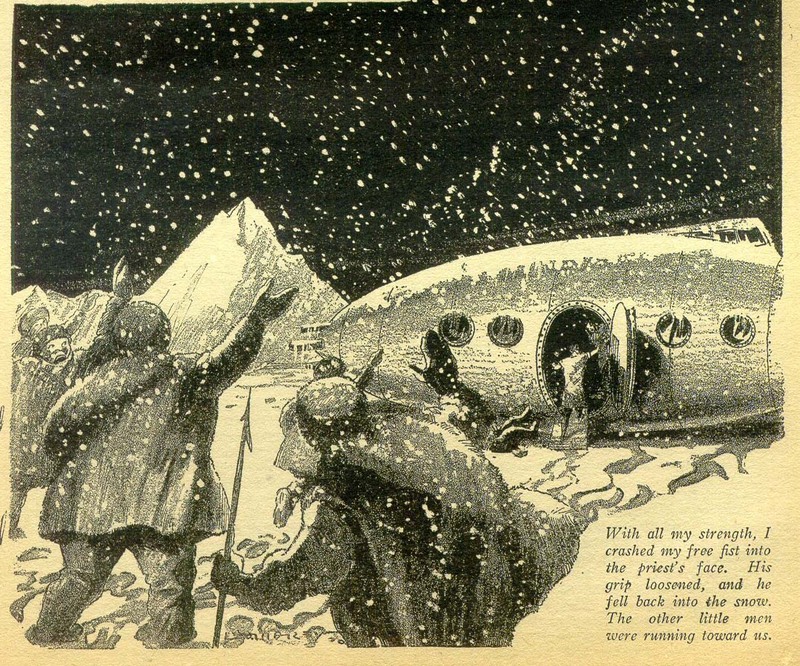 Ice has claimed the northern and southern points of the globe, but Frazer flies from Cairo in a flying machine. He stops at Mexico City and the Tower of Science. There, a scientist named Kivro, helps him to locate the tomb, which lies in what was once Chicago. North America is covered in glacial ice and inhabited by diminutive savages. Frazer finds the tomb resting in a village of these primitives. He uses a ray device to break into the tomb and revives Elaine. When they leave, the villagers appear and tell Frazer that Elaine is their queen. In the struggle to escape, the flying ship is damaged by the ray device and the couple are stranded in the cold. They decide to walk even though they know they will freeze to death. Exhausted, David covers Elaine before passing out. He wakes to find they have been rescued by Kivro. The tale ends with the couple contemplating their life in this strange world. 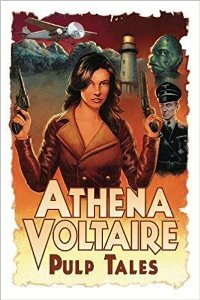 This last romance shows that Wertenbaker had grown to be an SF writer of some ability. Wertenbaker's favorite device is the younger man who tries out a scientific discovery made by an older man, always an avante garde scientist, working outside the accepted norms of science. Sometimes he is a kooky inventor like Professor Martyn; sometimes a respectable surgeon like Sir John Granden. The device is always the same though: the older man makes a discovery, but the younger man is game to try it out, usually with terrible consequences. If he had continued to write, it would have been interesting to see how he would leave this formula behind. How much of it was his own - and how much simply done to please Gernsback's requirement for scientist heroes and weird gadgets - we will never know. Wertenbaker's increasing ability to handle the human story within his narratives suggests better things to come. 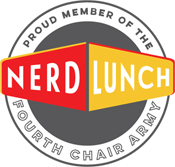 I got to be on the latest episode of Nerd Lunch to talk about two of my favorite things: theme parks and Thundarr! In order to create a Nerd Lunch theme parks, the fellas and I assigned each other individual lands to develop. So CT created Star Trek Land, Jeeg made Rock 'n' Wrestling Land, Pax invented Oz Land, and I designed Thundarr Land. It is super nerdy and super cool and you should listen to it. In this month's Southern Charm, Jody and I talk about the challenges facing Appalachia and the pros and cons of the Tennessee Valley Authority before comparing biscuit recipes and topping preferences. Who's In It: Barbara Stanwyck (Double Indemnity, The Big Valley), George Sanders (The Saint Strikes Back, Rebecca), and Gary Merrill (All About Eve, Mysterious Island). What It's About: An interior decorator (Stanwyck) sees a murder take place through her apartment window and her obsession with catching the killer (Sanders) threatens her sanity and her new relationship with the investigating police detective (Merrill). 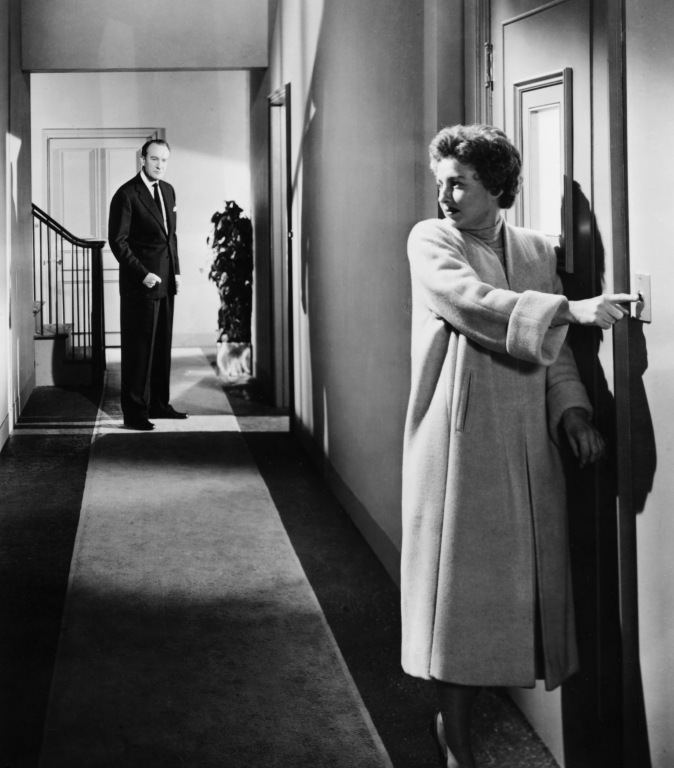 How It Is: Barbara Stanwyck is usually strong and I'm always a big fan of George Sanders, so I had high hopes for this variation on the Rear Window theme. Not that it's borrowing directly from Rear Window since it was released a few months before Hitchcock's film, but it was one of those Tombstone/Wyatt Earp or Armageddon/Deep Impact scenarios where similar films happened to come out uncomfortably close to each other. At any rate, I had every reason for high expectations for this grittier version of the concept. Unfortunately, all the main characters do dumb and/or unbelievable things in order to keep the story moving. Merrill's Larry Mathews is a horrible detective, from his sloppy investigation of the alleged crime scene to his revealing the witness' identity to the suspect and on to his dating the witness. Merrill is an affable actor, but his pleasantness only makes Mathews appear that much more befuddled and ineffectual. Stanwyck's Cheryl Draper starts off okay. Thanks to Mathews' incompetence, she at first questions what she saw and then decides to investigate on her own just to make sure she's not seeing things. But as she uncovers more and as the police continue to dismiss her, she gets weirdly panicky, which of course makes everyone dismiss her even more. I always hate scenes in any movie where a character thrashes around and screams about how sane they are. By the end of the movie, she's completely unstable, but I never believed any of the steps to her getting that way. As for Sanders' Albert Richter, his motive for the murder Draper witnessed is ridiculous. There's some nonsense about his philosophy of violence (he's even written a manifesto about it that the police are happy to ignore) and the woman he killed was simply a poor girlfriend who was in the way of his aspirations of marrying a wealthy woman. What it comes down to is that he found it easier to murder her than break up with her. 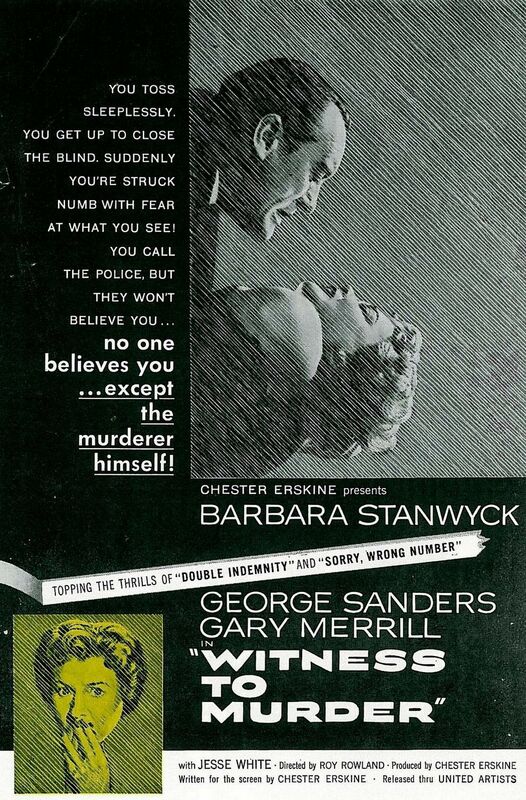 Witness to Murder should have been a great showdown between Stanwyck and Sanders, but the script is so awkward about putting them into combat that I was never able to get into it. Rating: 2 out of 5 dogged designers. 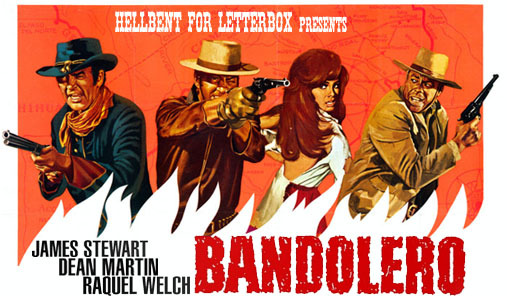 Pax and I discuss Bandolero! starring Jimmy Stewart, Dean Martin, Raquel Welch, and George Kennedy. 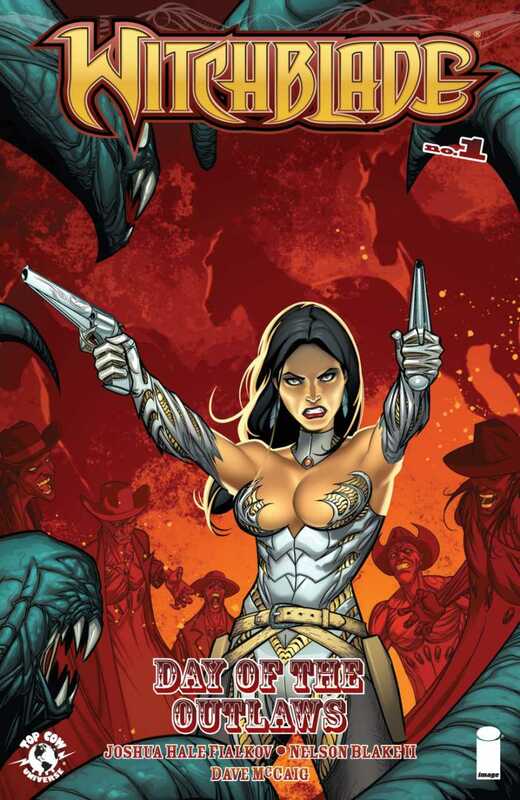 And in "Whatchoo Been Westernin'": Witchblade: Day of the Outlaws and the National Geographic Channel's Billy the Kid: New Evidence. Looking at copies of Jumbo Tales I was first struck by how lush these covers were (and who could refuse buying them? ), but secondly how each followed a formula of construction I like to call the Triangle. There is some variation, but the most popular examples feature three main focal points set in a triangle. These included the star hero or heroine, a threat (an animal or villain attacking), and a victim to be saved. The artist could vary which was largest in the picture but all three had to appear within that triangle. This got me looking back. When did this start? Did all jungle-themed comics have this cover formula? I started with the oldest comics, the Tarzan newspaper strip that began in 1929 (the Ape Man actually came late to comic books in 1947). Typically, especially during the film cover era, these were not "triangular" but usually a double image, Tarzan striking a pose with a weapon or object in his hand. The publicity stills of Lex Barker or Gordon Scott were easily produced and promoted the film's main asset, the actor. The later covers were paintings and required more animals and fantastic villains to be featured in them. But when Real Adventures Publishing entered the scene in 1938 with their general audience comic, Jumbo Comics, they didn't know that within their second year every cover would be a jungle cover, as their character Sheena, Queen of the Jungle rose to prominence in their stable of characters. By #18 (August 1940), the superhero covers were gone and the jungle would be featured on every issue until #159 in May 1952. That's 141 issues over 12 years! But that's just Jumbo Comics. Their sister magazine Jungle Comics, featuring Kaanga, would run 163 issues from January 1946 to Summer 1954. And then there was Kaanga, 20 issues on his own from Spring 1949-Summer 1954, with every cover a jungle triangle. The triangle had become the norm. Whether it was Rulah, Zoot Comics, Zegra, Jungle Lil, Jo-Jo, White Princess of the Jungle, or Yarmak in Australia, they all used the same formula. 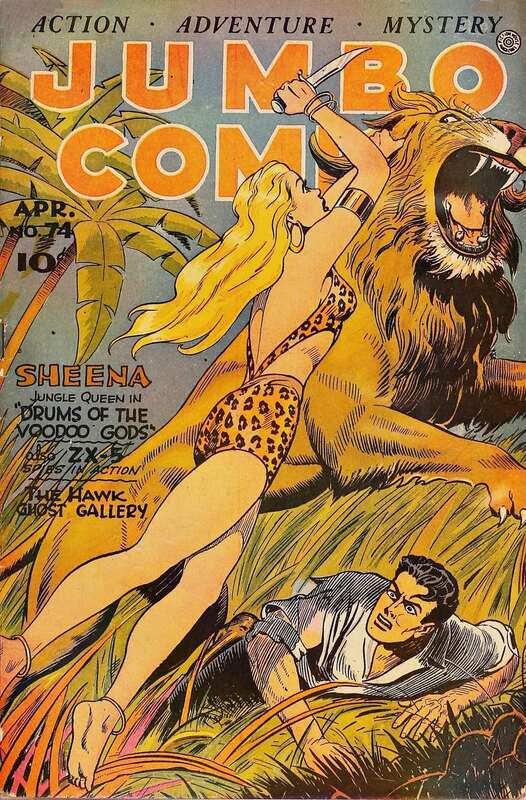 The one exception was Sheena, Queen of the Jungle, a solo comic that for 18 issues ran from Winter 1942 to Winter 1952-3. 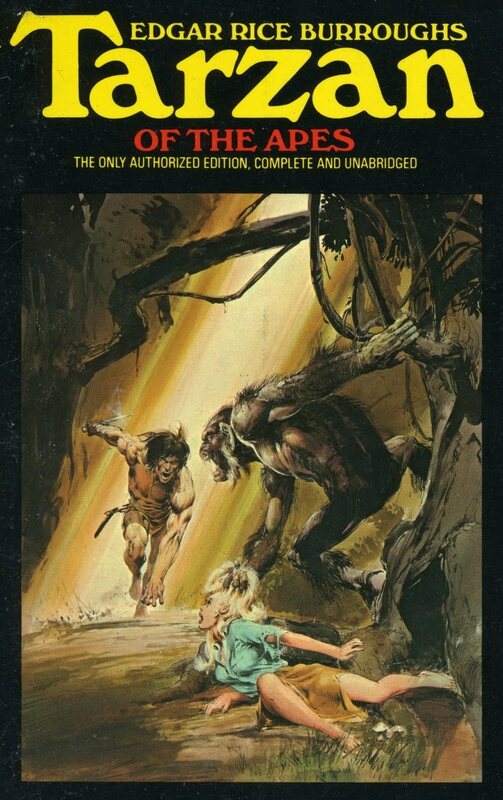 The Sheena covers sometimes returned to the Tarzan-style double image, with Sheena holding a weapon. Her star had risen high enough she could stand with the Ape Man. One variation of the triangle is what I call the Square. This works the same as the Triangle, but the artist sneaks in a fourth figure, usually a second animal, such as two hyenas rather than one, or a mount upon which the hero/heroine rides, such as an elephant or zebra. The Square came along in later years as the cover artists must have been quite bored by the typical cover of Sheena throwing herself from a tree limb to intervene with an evil hunter or tribesman. Where did the Jungle Triangle come from? Was Jumbo Comics #15 (the first full Sheena cover in May 1940) the first to use it? Not at all. I got to thinking about the very first Tarzan illustration of them all, Clinton Pettee's cover for Tarzan of the Apes (All-Story, October 1912). There was the triangle! 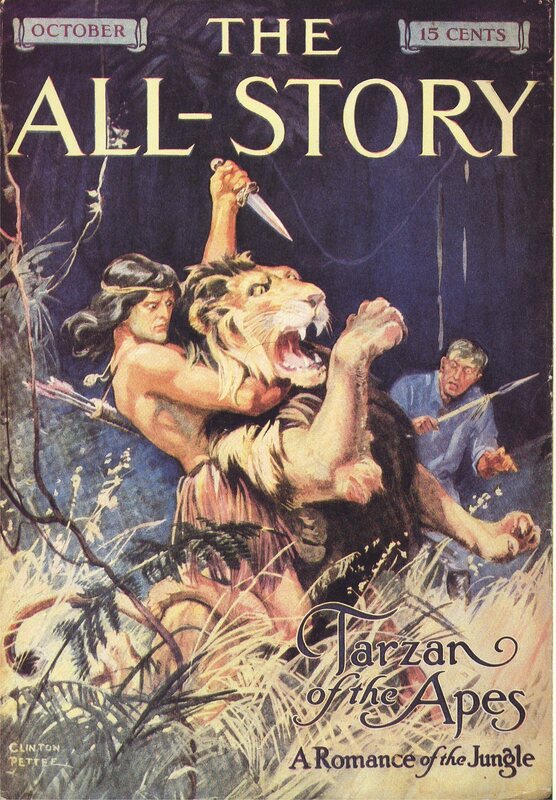 Tarzan straddling a lion, about to plunge his knife into its side, while on the ground, John Clayton lies, the intended victim. And of course, the jungle pulps later became jungle comics, as companies like Real Adventures phased out or doubled up their pulps - like Jungle Stories - with comics. These too had covers and what do you know... the Triangle! Clinton Pettee started it, the pulps and comics continued it, and even Frank Frazetta, the master painter, used it in 1952 for his Thun'da comics, which he abandoned when the strip dropped the caveman and dinosaurs angle. Frazetta returned to it in the 1960s when he came to paint his Tarzan covers like Tarzan and the Jewels of Opar. 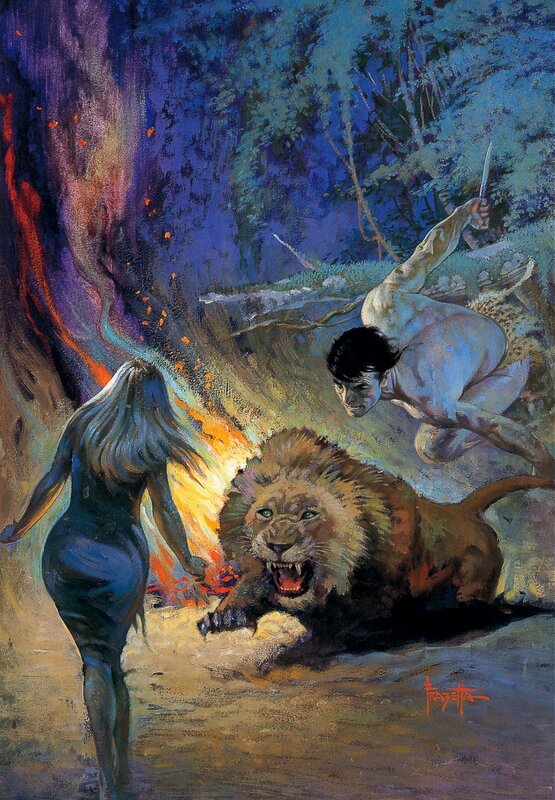 The fierce lion attacking Jane is about to get a surprise as Tarzan comes to the rescue. Later jungle comics such as Shanna the She-Devil and Ka-Zar did not use this formula as often (what would be so old-fashioned by the 1970s), but rather the typical Marvel-style cover. DC's Tarzan and Korak under Joe Kubert harkened back more to the old days, but Kubert adds a sizzle to the old formula that makes it his own. The most modern jungle girl covers by Dave Stevens or Frank Cho look more like publicity stills to a Sheena movie or pin-up art. The triangle lives on but only in subtle ways. 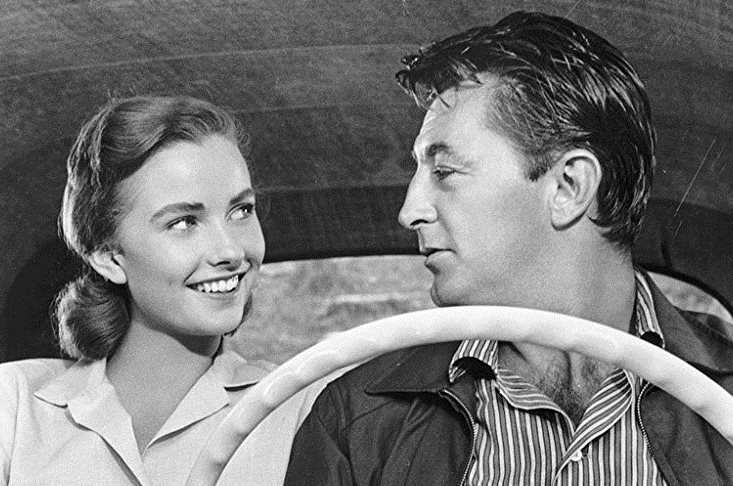 Who's In It: Robert Mitchum (Holiday Affair, His Kind of Woman), Jean Simmons (the original Blue Lagoon, The Big Country), and Jim Backus (Ma and Pa Kettle Go to Town, His Kind of Woman). What It's About: A man (Mitchum) is drawn into the world of a poor little rich girl (Simmons) who at best craves drama and at worst may be trying to murder her step-mother. 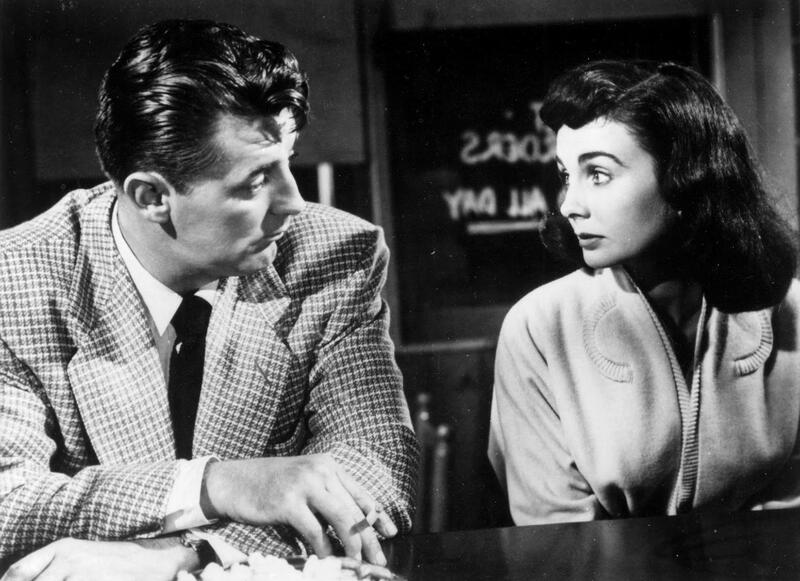 How It Is: I'm a big fan of Jean Simmons, so it was tough to watch her play such a miserable character. 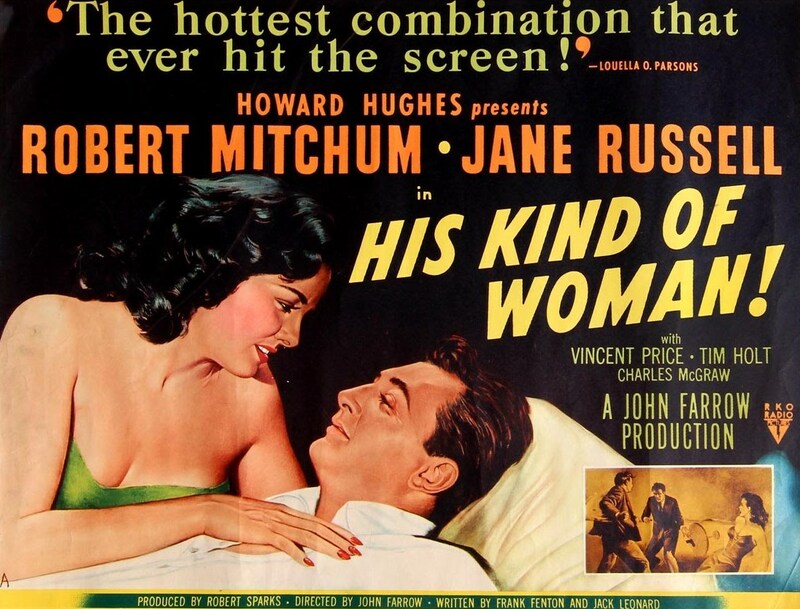 She does it well though and I was sucked into the story of her relationship with Mitchum's Frank. Frank is a complicated character himself. He's dating a woman named Mary (Mona Freeman), but insists that he's a romantic "free agent" and Mary acknowledges this, even if she doesn't fully accept it. So he's not a great guy, but he's also not exactly doing anything wrong when he starts to spend more and more time with Simmons' Diane. And I like that he's smart enough to recognize Diane's behavior as troubling. His problem is that he trusts his detachment to protect him from whatever Diane's planning. He always leaves himself an exit from her, thinking that he can walk away at any time, but he underestimates her intelligence and determination. 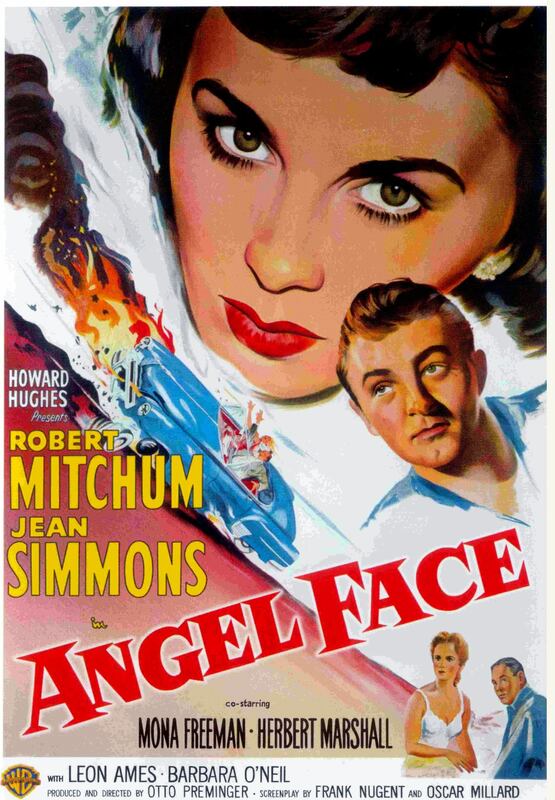 In it's own, noirish way, Angel Face has a strong feminist message for womanizing men. There's a part late in the movie where Frank's true flaw is clearly revealed. Like I said, he's not a great guy, but he's not an awful person, either, and there's a lot that I admire in him. He's smart, and even if he's determined not to commit to anyone, then at least he's up front about it. But while he insists on being free to hang out (and make out) with Diane, it becomes more and more evident that he wants to keep Mary on the hook as well. And he resents it when she starts showing interest in their mutual friend Bill (Kenneth Tobey). At one point, after Frank has been damaged by Diane and he's looking for comfort from Mary, he laments to her that he ever met Diane. Mary's response to him is great when she reminds him that Bill was also there when Frank and Diane met. Bill had the same opportunity as Frank to get pulled into Diane's web, but he resisted. Which means that Diane's not the problem in Frank and Mary's relationship; Frank is. It's a powerful revelation, powerfully stated. 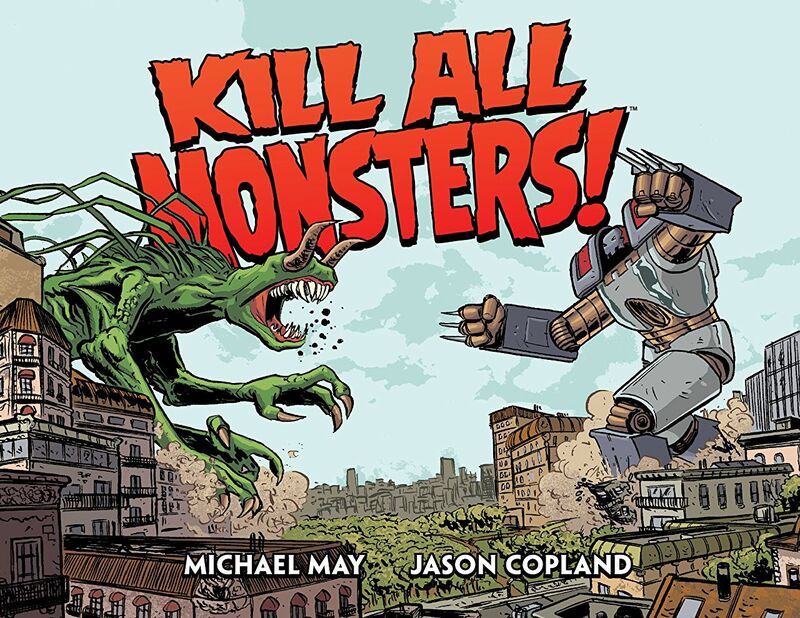 May’s tales of betrayal and determination bring freshness to well-worn subject matter, aided by Copland’s emotive grayscale illustration and some terrifically nuanced lettering from Ed Brisson. This collection also includes the new story “Island of Giants,” an intriguing and mysterious coda that skillfully expands an already impressive series. 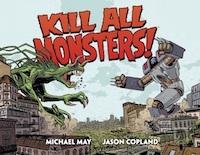 If you haven't already, you can get your copy at Barnes & Noble, Amazon, Comixology, or wherever fine comics are sold. It's Noirvember, so I'm taking the opportunity to watch some film noir movies this month. Not gonna do one every day or anything, but I hope to cover one or two a week. 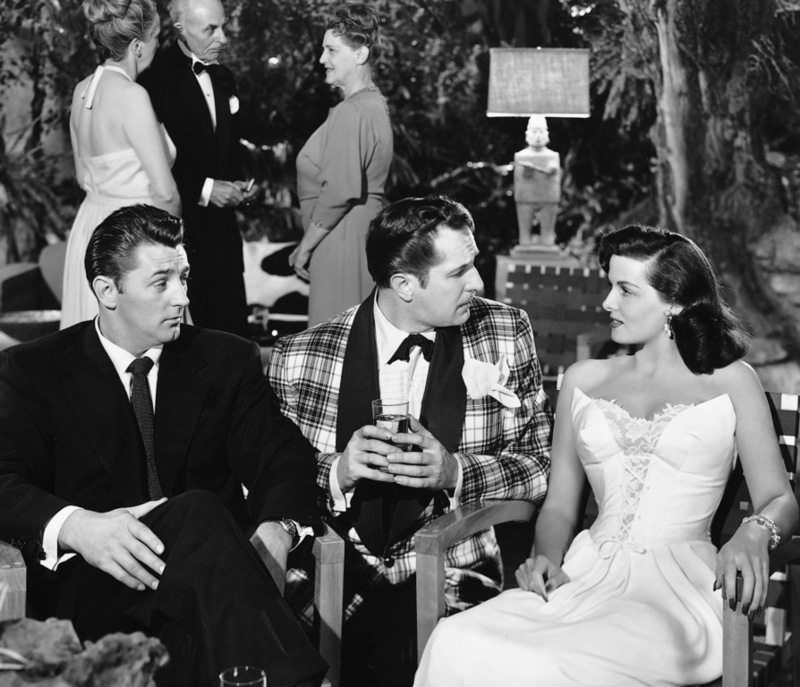 Who's In It: Robert Mitchum (When Strangers Marry, Out of the Past), Jane Russell (The Outlaw, Macao), Vincent Price (Shock, The Web), Raymond Burr (Rear Window, Perry Mason), and Jim Backus (Mister Magoo, Gilligan's Island). What It's About: Gambler Dan Milner (Mitchum) is coerced by gangsters to stay at a Mexican resort for mysterious reasons. It sounds like an easy job, but it gets complicated quickly by the resort's other inhabitants, which include thugs and government agents, but especially a singer (Russell) and the famous, married actor (Price) she's dating. 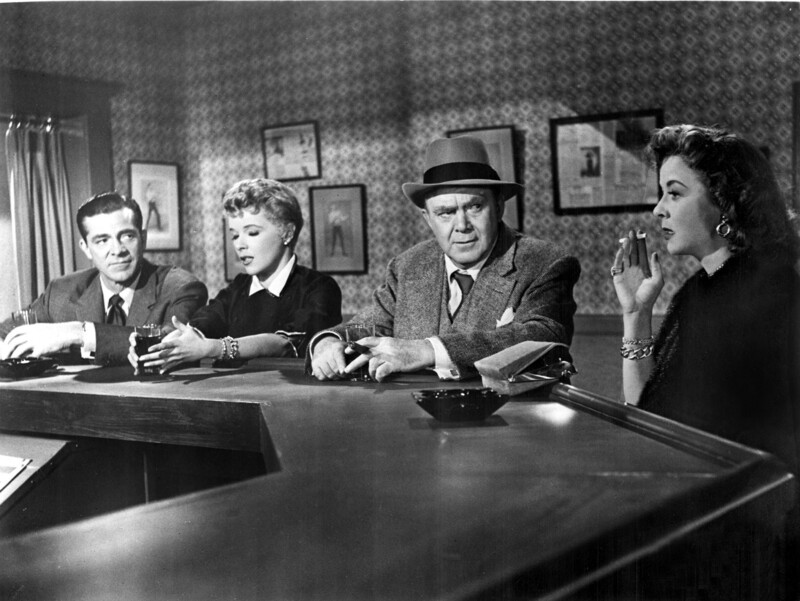 How It Is: One of my favorite noir films, largely for the cast, but the setting plays a big part, too. Most of the action takes place at the resort, which is a small enough place that everyone knows everyone else's business. It's full of colorful characters and reminds me of a tropical version of the resort in Dirty Dancing with lots of little dramas going on around the main one. Mitchum is one of my favorite actors ever and he's got great chemistry with Russell. (So much so that producer Howard Hughes wanted them back together for Macao, which I also like; just not as much as this one.) The film doesn't ask me to believe that they're falling deeply in love, but there's a palpable connection between them that convincingly throws their other plans into question. Dan is a charming, likeable guy and Lenore Brent (Russell) is funny and easy-going, even though she's clearly got secrets and some tragedy in her past. As the head of the gang that's manipulating Dan, Raymond Burr is neither as terrifying as his Rear Window character, nor as suave as Perry Mason, but he's intimidating as hell and makes the part better just by being in it. Backus isn't super important to the plot, but he livens up the place as one of the resort guests and I'm always excited to see him. I've saved Vincent Price for last, because he's one of the best characters, but also one of the most out-of-place. He plays movie star Mark Cardigan, a married man who's having an affair with Lenore when she meets Dan. Dan isn't the only one to throw a monkey wrench into Mark and Lenore's relationship though. Mark's wife (Marjorie Reynolds) shows up partway through, determined to put an end to her husband's philandering one way or another. How Mark reacts to and deals with all of this is unexpected and priceless. I love the character. Or I do until the climax of the movie. It's around then that Mark realizes that he's tired of just playing adventurers onscreen. As he discovers what's going on around Dan, Mark sees an opportunity to participate in a real adventure. Which is very cool, but the script turns him into a cartoon character after that. His dialogue becomes almost entirely quotes from Shakespeare and his decision-making is absurdly comical. Price is great at it - totally hamming it up - but the character doesn't fit the rest of the movie anymore. Mark doesn't ruin the movie at all, but he does keep me from loving it as much as I would if he'd been reined in. Rating: 4 out of 5 plaid jackets. David, Dave, and I are joined by special guest Rob Graham to talk about Gales, Goblins, and Goro. And after learning what connects them all, we reveal our favorite '80s fantasy movies. The Northern was Canada’s one true contribution to genre literature. The majority of Northerns are tales of fur trappers or gold miners: strong men and women pitied against the rough conditions of life in the wilderness. 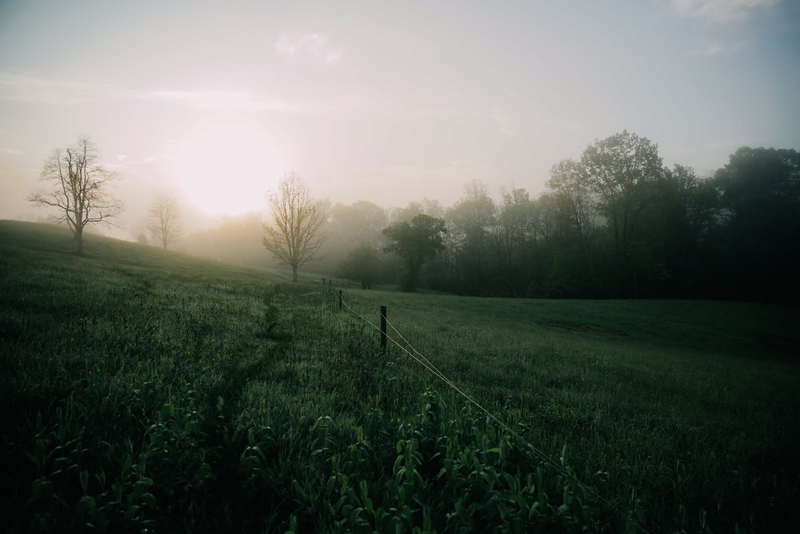 One book amongst these tales of hunting, trapping, and the lives of the animals that dwell in quiet places belongs to another genre as well. The book is November Joe (1913) by Hesketh Prichard. Despite being a Northern of the highest order, it is also a detective novel, or rather, a collection of detective stories. 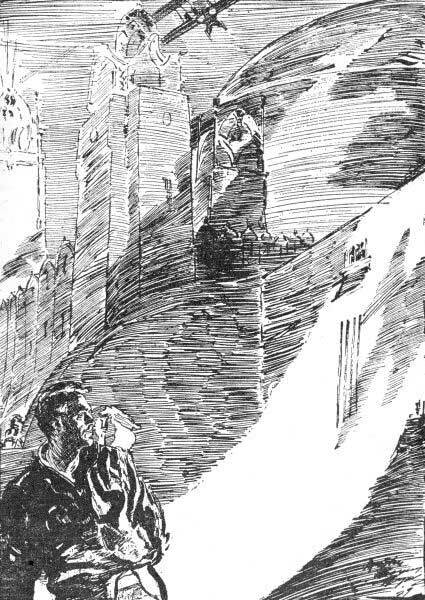 Prichard's detective possesses the Sherlockian ability to see what others do not: "...Where a town-bred man would see nothing but a series of blurred footsteps in the morning dew, an ordinary dweller in the woods could learn something from them, but November Joe can often reconstruct the man who made them, sometimes in a manner and with an exactitude that has struck me as little short of marvelous." The character of November Joe is incredible, but no more incredible than the man who created him. Hesketh Prichard was the son of a British officer who died weeks before his son's birth. Raised in England by his mother, he trained for the Law but became a writer instead. Through his acquaintance with JM Barrie, Prichard and his mother went to work for Cyril Arthur Pearson, the owner of Pearson's Magazine in 1897. Under the pseudonym E and H Heron, the mother-son team wrote a dozen tales of ghostbreaker Flaxman Low. But Hesketh was not limited to horror stories. He wrote books about hunting, sports, and his travels. These caught the attention of President Teddy Roosevelt who called Prichard's Through Trackless Labrador (1911) the best book of the season. With the coming of World War I, Prichard enlisted as an "eyewitness officer" in charge of war correspondents. 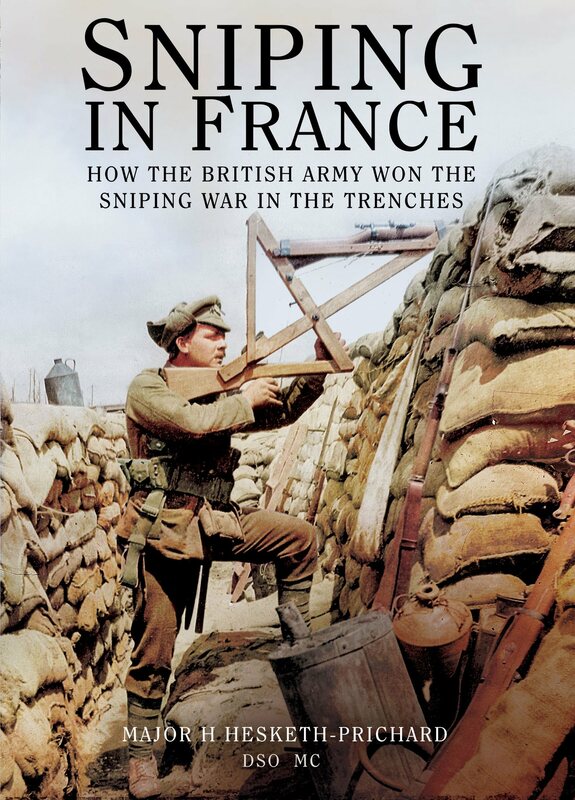 His observations at the front led him to lower the number of British casualties from snipers. He developed several techniques to locate German snipers, including inventing the dummy head and improved trench design. He also spent his time and his own money improving British sniping rifles and techniques. For this he was given the Distinguished Service Order in 1917. To say the least, Hesketh Pricard knew guns, shooting, and the wilds of Canada; all part and parcel of the story of November Joe. November Joe begins with our Watson, Mr. James Quaritch, leaving work for three months to go shoot moose. His friend, Sir Andrew McLerrick, recommends November Joe as his guide. Upon arriving in the woods of Quebec where Joe lives, Quaritch is asked to deliver a message to Joe. The Provincial Police offer him fifty dollars if he can find the killer of a dead trapper. The hunting trip off, Quaritch convinces Joe to let him tag along. "The Crime at Big Tree Portage" gives Quaritch plenty of opportunities to see November Joe in action. 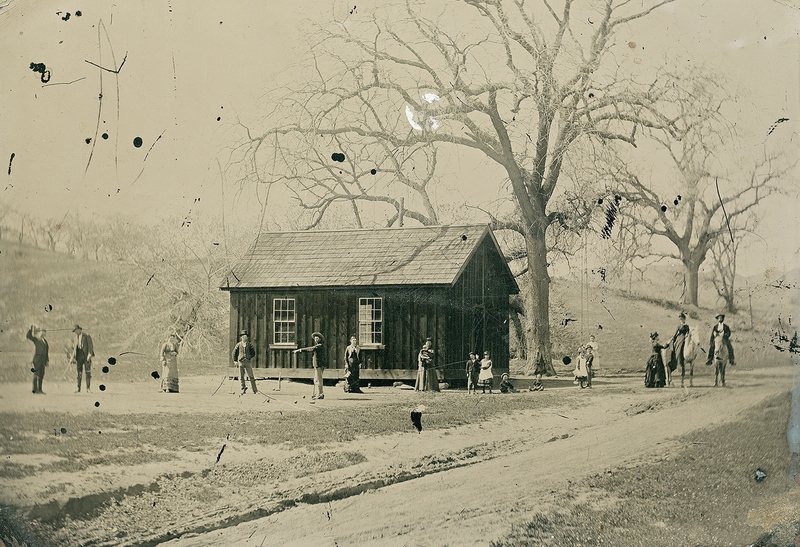 The two men go to the lumber camp at Big Tree Portage where the dead man, Henry Lyon, lies. Joe quickly accesses the few clues, seeing that the killer pulled up in a canoe, called to the man, and then shot him, leaving virtually no evidence. But Joe isn't stymied. He backtracks Lyon to his camp before the murder. Here he finds two beds of spruce boughs and evidence of the identity of a second man. Going to the small town of Amiel, November Joe finds out the background of Lyon's life, the names of all the men away trapping, and quickly narrows his suspect list to one man. He and Quaritch visit the man and quickly get a confession. When they learn of his reasons for the killing, Joe helps him destroy evidence, making it impossible for the police to follow the trail. The fifty dollars is not as important to Joe as his sense of backwoods justice. "The Seven Lumberjacks" has local tree-fallers being robbed by a gang of thieves. False evidence has them accusing their boss, Mr. Close, of the deed, but Joe's careful examination of the ground tells him that the gang is only one man, and one of the lumberjacks. He sets a trap too tempting for the thief to resist. "The Black Fox Skin" has a widow, Sally Rone, seeking out Joe because someone is robbing her traps: a ploy to force her to marry or starve. One of the pelts that is taken is a black fox pelt worth eight hundred dollars. Suspicion falls on Val Black, one of Sally's suitors, when he is found with stolen furs and a condemning bullet is found in Sally's cabin. November Joe suspects a frame-up. He sets a trap for the culprit and Sally and Val are free to marry. "The Murder at the Duck Club" is almost an English cosy with its select club members and enclosed space. Young Ted Galt is accused of murdering Judge Harrison while out shooting geese. The tracks do nothing to clear the fiance of Harrison's daughter, Eileen. Instead of tracks, Joe examines the guns that have been so damning for Galt, as only he uses size 6 shot in his shotgun. Joe gleans a different motive and quickly rounds up the killer, someone else with a grudge against the judge. "The Case of Miss Virginia Plank" has November and Quaritch looking for a murdered girl. November's careful tracking proves the girl is not dead, but kidnapped. Later, after meeting the kidnappers (a big man who talked and a small one who didn't), November is onto the truth. The tracks of the small man reveal his moccasins are too large. November knows that Virginia Plank was the small man and the kidnapping is a set-up. With a knowledge of civilized girls and a little poking around, he identifies the girl's accomplice, Hank Harper, and finds her at his cabin. Virginia explains why she pulled the stunt, and like in "The Crime at Big Tree Portage," November's sense of justice outweighs his sense of law. "The Hundred Thousand Dollar Robbery" has Joe following a missing banker named Atterson, who has absconded with $100,000 in securities. Joe finds the man, but realizes that he has been robbed in turn and in fact used by another to commit the crime. He deduces who would have been able to turn Atterson's head and tracks down the woman, getting the money back. "The Looted Island" has a fox farmer named Stafford robbed of $15,000 in fur. His employee, Aleut Sam, is also missing. Joe agrees to track down the culprits for ten percent of the furs' value. The island is frozen and icy, so there aren't any tracks to follow. Instead, November examines the fox pens and the cabin where the robbers camped out for a few days. This produces some information, like the fact that all the carcasses are from red foxes, not black. Someone has taken the foxes and tried to make it look like they were killed. Before they can act, the three men notice smoke coming from the neighboring island. Here they find Sam who tells a story of being stranded for eleven days. November examines his campfire and knows he is lying. The ashes indicate only a two-day stay, as Sam has no axe with him. Stafford forces the truth out of Sam and the men are off to Jurgenson's fur farm. The Swede can’t deny the evidence November provides and agrees to return the black foxes and two extra for their trouble. "The Mystery of Fletcher Buckman" is a traditional train murder mystery. Buckman is an oil expert traveling with his wife. He is to make a report that will either increase or decrease certain stocks. The man is found dead, hanging like a suicide. November quickly puts this idea to rest for he finds fingermarks on the man's throat where he was strangled. The report has also been stolen. A man who had been arguing with Buckman, a down-and-out oil worker named Knowles, looks like the killer, but November proves this untrue based on the clues in the murdered man's car. Taking all the evidence and geography in mind, November leads the provincial police to the post office where the killer is about to mail the stolen report. This story breaks one of the classic Ronald Knox's fair-play rules: "The criminal must be mentioned in the early part of the story...". The culprit is never even named, let alone known to November Joe. The story is more about proving Knowles innocent and tracking the killer. 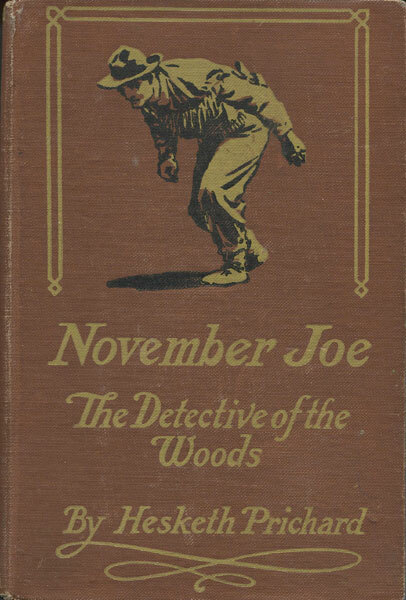 The remaining chapters, "Linda Petersham," "Kalmacks," "The Men of the Mountains," "The Man in the Black Hat," "The Capture," and "The City or the Woods" tell the final tale of November Joe. (The previous chapters were obviously short stories sold to magazines, and now Prichard is attempting to give the book a final episode to fill it out.) Quaritch is approached by an old family friend, Linda Petersham. She's worried about her father, who has purchased a large hunting concession called the Kalmacks. In fairness, he paid out the local squatters, but someone has sent a death threat if Petersham doesn't pay another $5000. Quaritch brings in November Joe and all four are off to the wilds, surrounded by lurking danger. Upon their arrival, Petersham is informed that one of his game wardens, Bill Worke, was shot through the knee while at Senlis Lake. November's tracking about the lake finds a 45.75 caliber cartridge. November has Petersham dump two loads of sand from the lake around the house to improve tracking. This keeps the blackmailers away for a while, but eventually they make their demands that the $5000 dollars be left at Butler's Cairn. The demand comes from a masked man who holds up the other game warden, Ben Puttick, at rifle point. Petersham doesn't want to pay and Joe agrees. He slips out the window and covers Butler's Cairn, but no one shows. This makes him suspicious so he sets up a plan for the following day. November leaves for Senlis Lake, making sure everyone knows where he is going. Shots are heard and Quaritch runs to the lake to find Joe shot. Together they look at the body of the shooter, a man in a black hat with a beard. Joe has killed him with a shot to the throat. 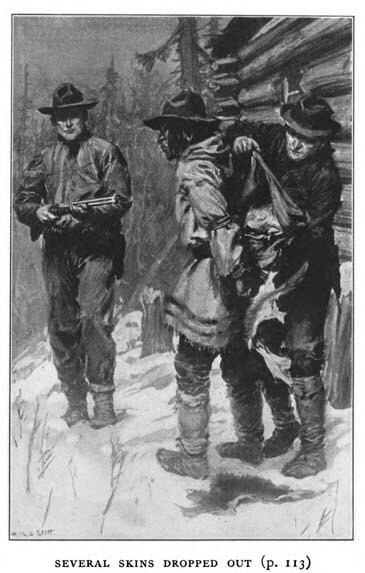 Quaritch carries Joe back to the cabin where he reveals that the mole in their group is Puttick. 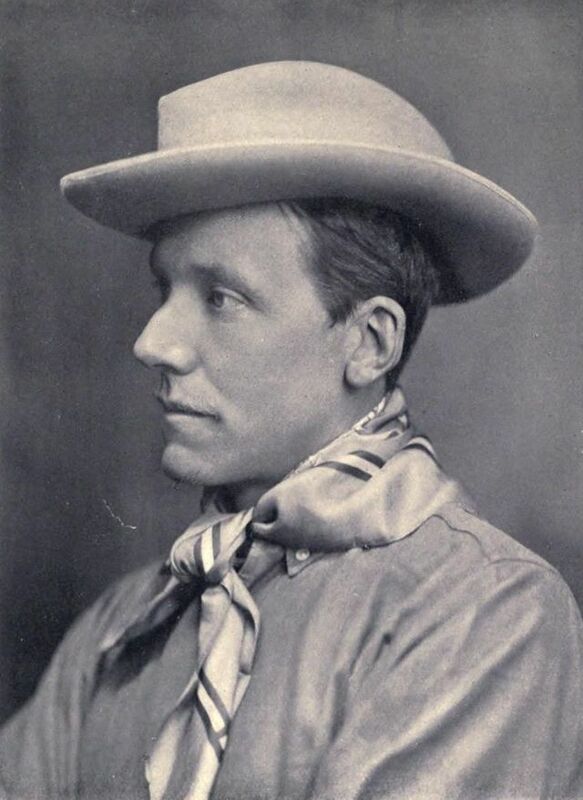 The dead shooter is identified as Dandy Tomlinson, who with his brother, Muppy (both names worthy of Jack London), devised the plan with Puttick. What struck me as interesting about this ending is how, in essence, it is the same as the final pages of Tarzan of the Apes by Edgar Rice Burroughs. Burroughs would write his most famous novel around the same time, so I'm not suggesting either author had any influence on the other. What I am suggesting is that the theme of both is that the Natural Man refuses to be corrupted or tamed by civilization. Tarzan returns to his jungle, more ape than man. The difference is that Tarzan of the Apes was a huge success followed by twenty-three sequels. The first of those was The Return of Tarzan, in which Tarzan and Jane are united at last. Jane and Tarzan build a ranch and remain in Africa. This is a choice that November Joe refuses to think of for Linda Petersham. He knows she is a creature of civilization and will never be happy living the mean existence of a trapper's wife. Planetary Union Network | Bruce Broughton and "Majority Rule"
On the latest Planetary Union Network, we had the pleasure of interviewing composer Bruce Broughton, who wrote not only the Orville theme, but tons of classic movie scores from Ice Pirates and Monster Squad to Silverado and Tombstone. He was a great guy to talk to and I love the passion with which he answered my question about the many scores he wrote for Disney theme parks. The best part though is when he talked about the difference between scoring Westerns and Science Fiction and then demonstrated on the piano! The episode is worth listening to just for that. But if you're into The Orville and wanna hear us talk about "Majority Rule," my favorite episode since "About a Girl," then there's that, too. On the latest N3rd World, we dig into both Blade Runner and Blade Runner 2049 before discussing the final trailer for Last Jedi. The Blade Runner discussions are spoiler-filled, but I think we did a good job articulating why we all love both movies. And I also think we get a pretty good handle on deciphering what expectations the Last Jedi trailer wants us to have for the movie.